President Donald Trump attacked Democratic megadonor Tom Steyer, who is funding a campaign calling for the president’s impeachment. Steyer has poured millions of dollars into Democratic campaigns and is reportedly considering a run for Senate or governor in his home state of California. 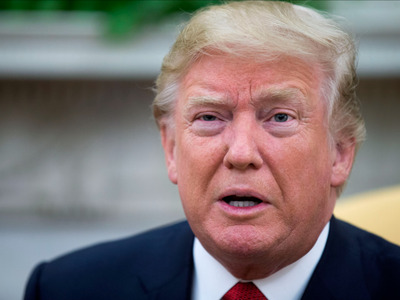 President Donald Trump attacked Democratic megadonor Tom Steyer, who has launched a $US10 million national television and digital ad campaign calling for Trump’s impeachment. “Wacky & totally unhinged Tom Steyer, who has been fighting me and my Make America Great Again agenda from beginning, never wins elections!” Trump tweeted on Friday morning. Steyer, a California billionaire environmentalist and former hedge fund manager, released the campaign’s first ad last week. In the ad Steyer accuses the president of obstructing justice by firing former FBI Director James Comey, threatening the news media, and taking money from foreign governments. “A Republican Congress once impeached a president for far less, yet today people in Congress and his own administration know that this president is a clear and present danger, who’s mentally unstable and armed with nuclear weapons,” Steyer says in the ad, which directs viewers to sign a petition on needtoimpeach.com. “Fox & Friends” aired the ad for the first time on Friday morning, and Trump praised the show in a tweet just minutes after attacking Steyer. Steyer responded to Trump’s tweet on Friday, calling on Democratic leaders to “take a stand” against the president. Steyer spent over $US90 million on the 2016 presidential race and a number of other Democratic campaigns and initiatives last year. His super PAC, NextGen Climate, supports candidates committed to slowing the effects of climate change. He also invested tens of millions of dollars in the 2014 election cycle. Steyer is reportedly considering a run for Senate or governor in California.